Let us hold fast the confession of our hope without wavering, for He who promised is faithful. - Hebrews 10:23. The author of the book of Hebrews wanted to help Christians understand that Jesus is the Messiah; how his life fulfilled prophecy; how our faith comes from him and how we should hold on to him no matter what. 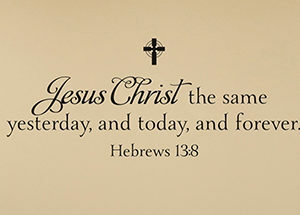 Verses such as Hebrews 13:15, 11:3 and 12:2 do make for encouraging wall decals. They urge the believer to praise God who is also their creator and the anchor of their faith. How grand these wall letters look when they are on the walls in your home: be they in the living room next to the windows; in the bedroom complimenting a comforter, or in the bathroom between the mirror and the vanity table. No matter which room they end up in, you can be sure that the wall quotes will pass on a message of hope and style up your rooms. They are excellent accents. So pay us a visit on our By Book of the Bible category and view our wall lettering selection from the book of Hebrews. Not only are they affordable, they are also easy to maintain. They carry a priceless message that will be a source of hope to your dear ones. They will make your home look good too!